Eminent Sarod artist Pt. Alok Lahiri along with his wife Kajal Lahiri and son Abhisek Lahiri, operates a school of Music at his residence through which he has become a beloved teacher of Sarod, Sitar, Slide Guitar and other instruments to scores of students of all ages in home and abroad. Sur Sangam Ramrajatola organization formed in 1987 by Pt. Alok Lahiri and since its evolution Sur Sangam Ramrajatola is organizing various concerts of Indian Classical Music in different parts of Kolkata and West Bengal for the promotion and propagation of Indian Classical Music. 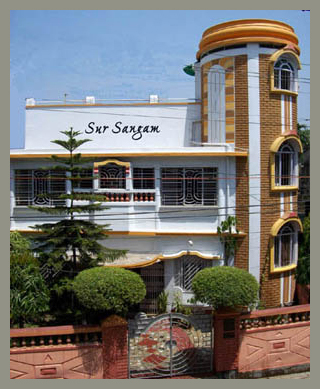 Sur Sangam Ramrajatola now has several branches spread across West Bengal. Sur Sangam Ensemble project was created and formed in 1990 by eminent Sarod player of India Pt. Alok Lahiri. Ever since its evolution Sur Sangam Ensemble is giving live performances in home & abroad and winning the hearts of numerous music listeners. This Ensemble projects reflects the compositional skills of Master Sarod Player, Pt. Alok Lahiri. This melodic & rhythmic ensemble music gives immense pleasure & satisfaction to human mind, heart & soul.